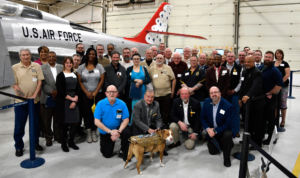 M-SPAN hosted the annual Buddy-to-Buddy Program Volunteer Recognition Event on April 7, 2018 at the Yankee Air Museum. Program volunteers from around the state were recognized and celebrated for the tremendous work they do assisting fellow veterans. Col. Andrew Roman, Michigan National Guard Chief of Staff, gave the keynote address and helped present the Michigan National Guard Distinguished Service Medal and the Michigan Legion of Merit Medal to 14 exceptionally outstanding volunteers veterans.